Now works with iOS 7! Please update to rev 4.7.0, available on the AppStore now!! Ricky Amano, the developer of iTreadmill, suffered a ruptured brain aneurysm in February 2013. Although he had a stroke, he was misdiagnosed twice until the aneurysm was discovered 5 days later. While he miraculously survived, about 80% either die or suffer permanent neurological deficits. Lack of awareness is a significant problem, as victims are commonly misdiagnosed. A link to his story is provided below in order to increase awareness and help prevent tragedy from devastating other families. 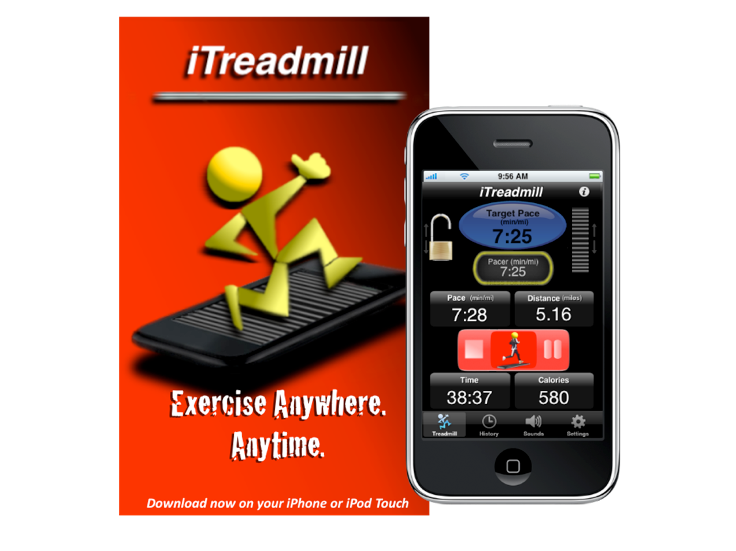 iTreadmill is one of the top exercise apps for all iPhone and iPod Touch devices, having been ranked as high as #3 on the App Store for the Health & Fitness category. Now you can have the power of a treadmill wherever you go, right in your pocket! Imagine walking or running outdoors or indoors while monitoring all of the information you would normally see on a treadmill, such as pace, speed, distance, time, calories, step count and strike rate! 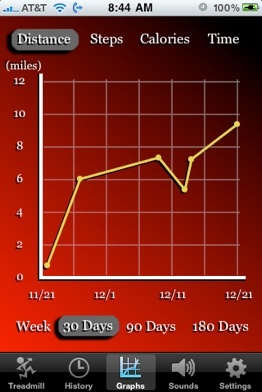 All of this information can be viewed in real time or view all of your workouts on a history list and on a graph. A pacer dial allows you set your pace or speed just like a real treadmill. A ticking sound is generated which helps you to keep close to your desired pace/speed by simply stepping to the sound. You can even set a goal for distance, time, steps, or calories. 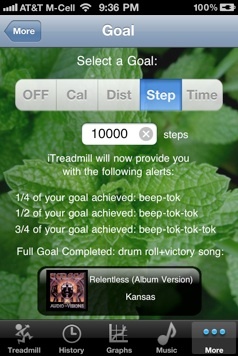 iTreadmill will notify you when you are 1/4, 1/2 and 3/4 of the way toward your goal. When you finally reach your goal, your victory song of choice will be played to help you to celebrate! iTreadmill uses the accelerometer (motion sensor) that is built into every iOS device to count your steps when you walk or run. It measures the natural up and down motion of your body when you take each step. 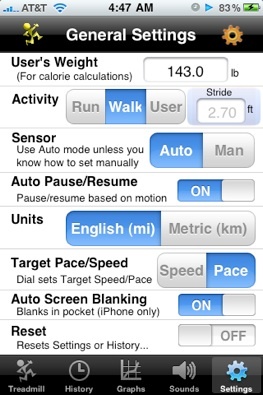 Using a proprietary signal processing algorithm called PocketStep, it is the most accurate pedometer there is. Because no GPS is used, it may be used indoors as well as outdoors, uses much less power, and does not require any data connection of any kind. iTreadmill uses a simple method to accurately determine your stride (distance of each step) with a novel method called distance correction. It is very simple to use and very accurate! Get iTreadmill on the App now!